Smart travelers know that they need to budget for travel insurance. However, data from the US Travel Insurance Association shows that almost 70 percent of travelers choose to travel without purchasing an insurance policy. Big mistake, since statistics also show that one out of every six individuals who purchase travelers insurance end up filing a claim. Part of the problem consumers have with purchasing travelers insurance is lack of understanding of the type of coverage they need. InsureMyTrip.com offers consumers a one-stop-shop to compare travel insurance policies and claims to offer expert guidance to help you save money and get the policy best suited for your trip. Searching for a travel insurance quote can be a tedious process, but InsureMyTrip.com understands that a clean site design helps to avoid fumbling around to find the information you need. Right on the home page, you can check out recent news or view the most popular topics to see what other travelers are searching for. The best feature on the home page is access to company profiles for the travel insurance providers partnered with InsureMyTrip.com. This information includes basic data on each business as well as contact numbers for claims and assistance, so you can quickly get access to help when needed. The front page also does much to inspire consumer trust in the insurance comparison site. 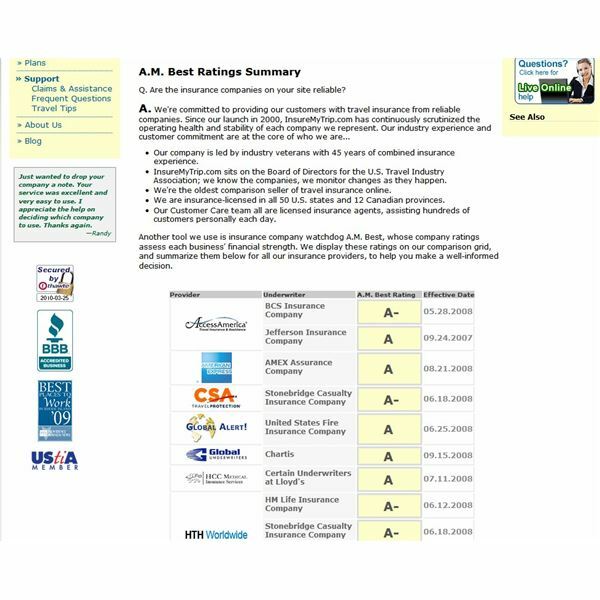 A quick search at the Better Business Bureau reveals that InsureMyTrip.com is a BBB Accredited Business with an A rating and they are a member of the US Travel Insurance Association. Worried about the stability of a travel insurance company? When reviewing policies at InsureMyTrip.com you will have access to A.M. Best Rating information on travel insurance companies. The industry watchdog grades companies on their financial strength and is a good indicator of the risk potential of the policy provider. What sets InsureMyTrip.com apart from other travel insurance comparison sites is the ability to build a custom travel insurance quote based on your trip details. Policies covering medical emergencies, evacuations, business trips and flight cancellations are available. To get started with the quote form you will have to enter in some basic information about travelers’ ages, trip cost and destination. When reviewing results from insurance providers the initial list of companies can be a bit intimidating to wade through. However, travelers with no knowledge of travel insurance will appreciate the ability to choose several companies at a time and compare features and prices side-by-side. After providing personal details and credit card information you can purchase the policy and receive a confirmation email in only a few minutes. The fast turnaround time and access to all major travel insurance providers will allow consumers to get the best rates on insurance. InsureMyTrip.com takes customer service seriously. Are you confused about which policy best suits your adventure trip? Need to find a policy that covers terrorist threats when overseas? A phone call to their customer service line will connect you with a licensed insurance agent with years of travel experience. Unlike some other sites, you won’t get an upsell since agents don’t work on commission. 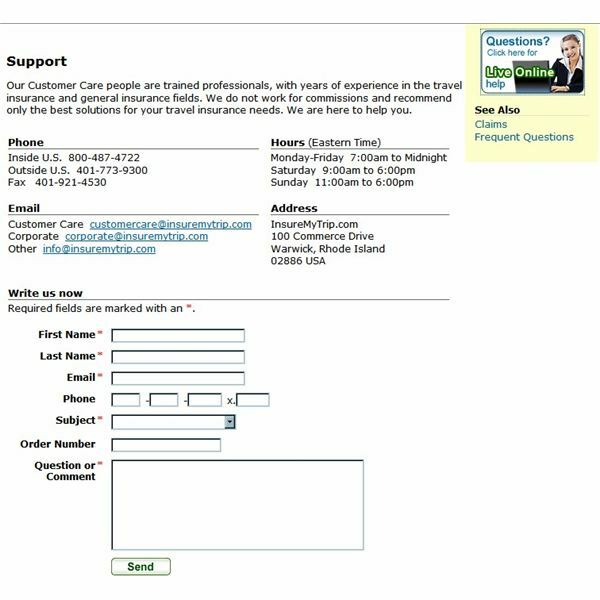 Though customer service is provided by phone, email and fax the online chat service is the real selling point of the site. Agents are fast to respond once you initiate a chat and have the knowledge to answer your questions. 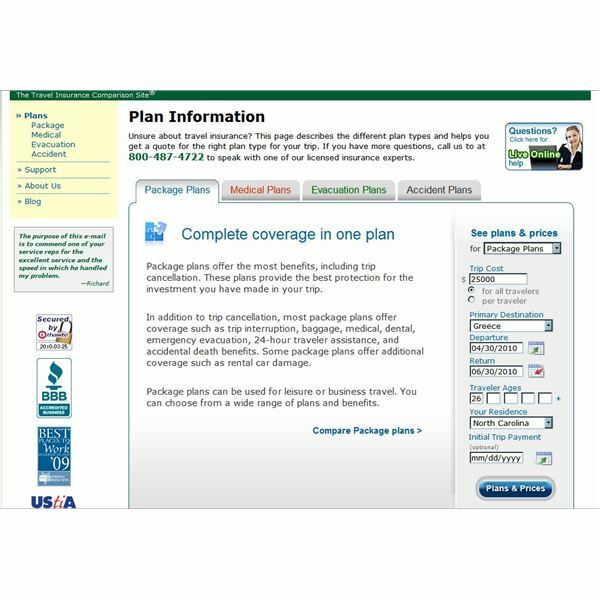 InsureMyTrip.com is a reliable solution for travelers looking to save money on travel insurance. Though the site offers over a 100 different polices to choose from its sleek web design and simple travel insurance quote form, it also allows consumers to narrow down their options and find the policy that best matches their travel plans. For beginners and those who need more information before making a final decision, the site is upfront with contact information and offers several ways for inexperienced travelers to get the aid they need.